Storage is a ticklish problem. It is costly and there is never enough of it. We have downsized our house, but we still have some furniture and sentimental items that we want to keep. To preserve our bank account, and relationships with family, we needed to be inventive. 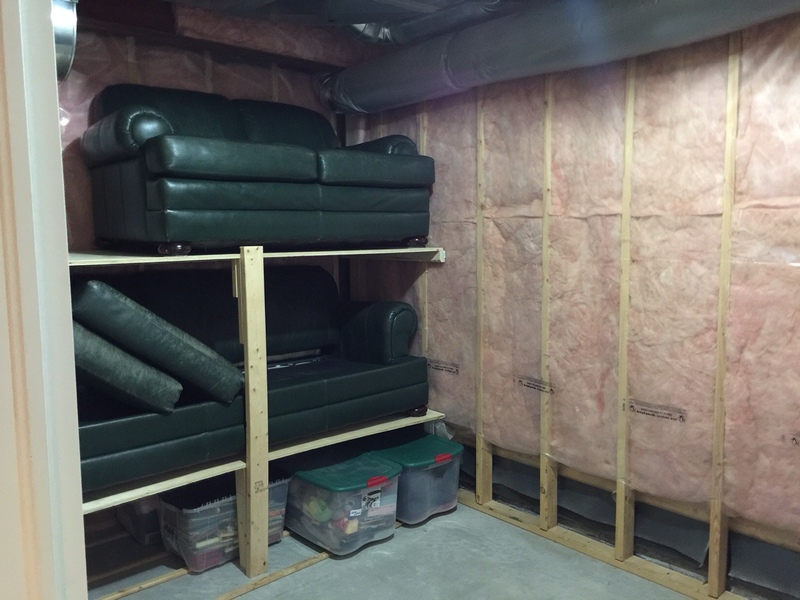 Our tenants have agreed to let us store our belongings in a 5′ x 13′ room in the basement of our house. We will use this space for storage while we are on our catamaran. As an aside, Ottawa-based sailor and circumnavigator, Herbert Stuemer, also stored his belongings in his house. 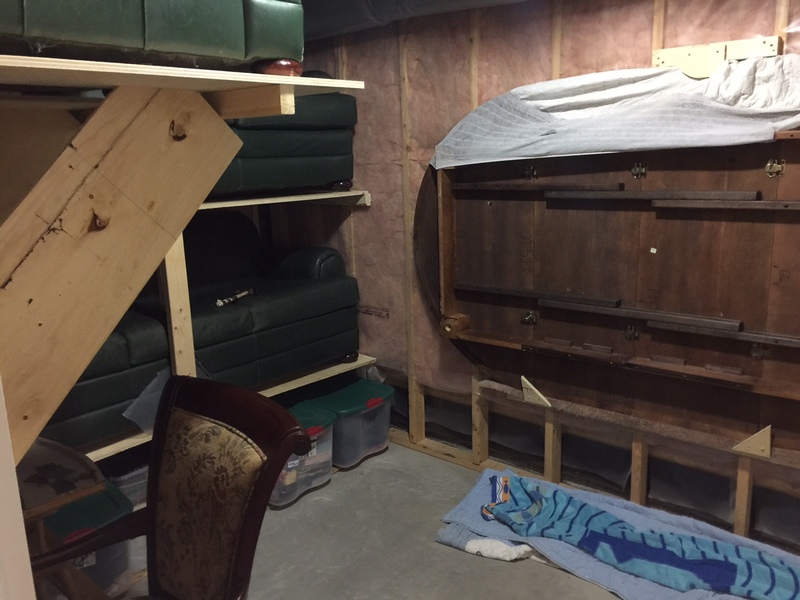 Except in his case, he put up drywall to enclose his belongings in his basement. He needed a sledgehammer to retrieve his things. Our belongings will be in a locked room instead. We started the day with a bare room, as shown in the photo below. My husband is very handy. He got to work to build shelves to store our furniture. The first shelf is built. Here we are testing the concept with a chair. The bottom shelf is high enough that we can store plastic storage bins below the shelf. He added a support beam for strength. 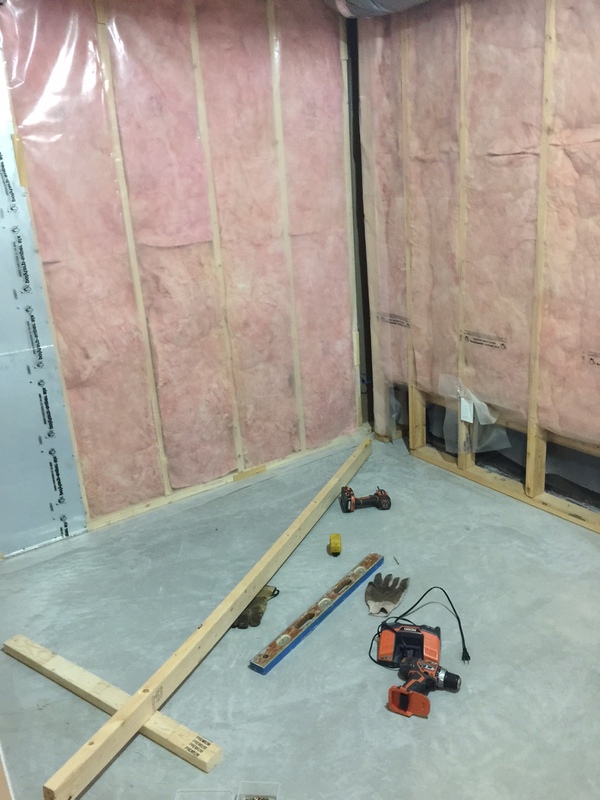 And, we put some beams along the floor, to elevate the boxes to keep our things dry in case of flood. 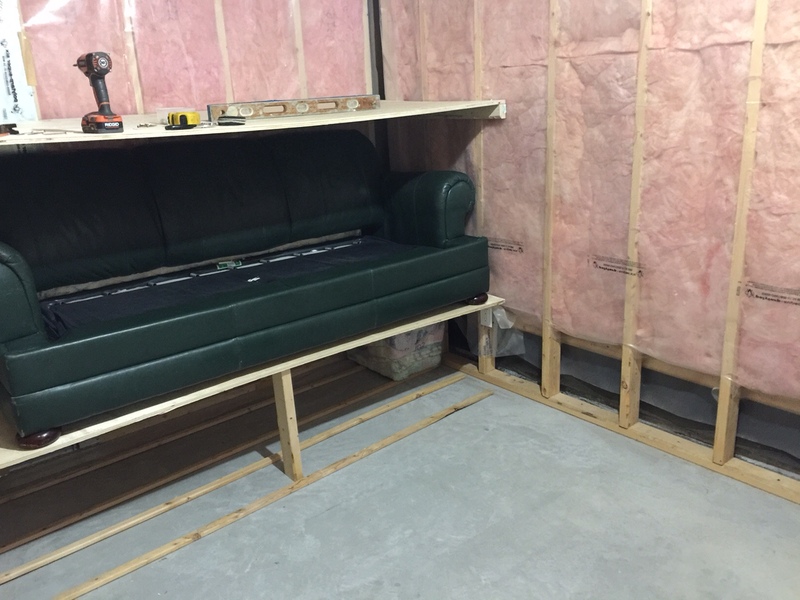 Couch is in place. Here we tested our marriage by carrying heavy objects together. He added further support to the top shelf. 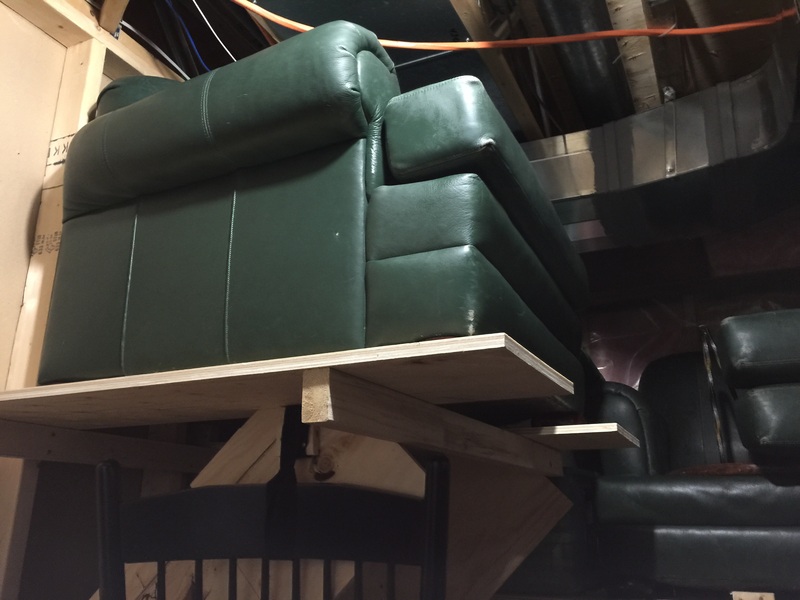 And, we lifted our loveseat above our heads to put on the shelf that he had built. More support is put in place. 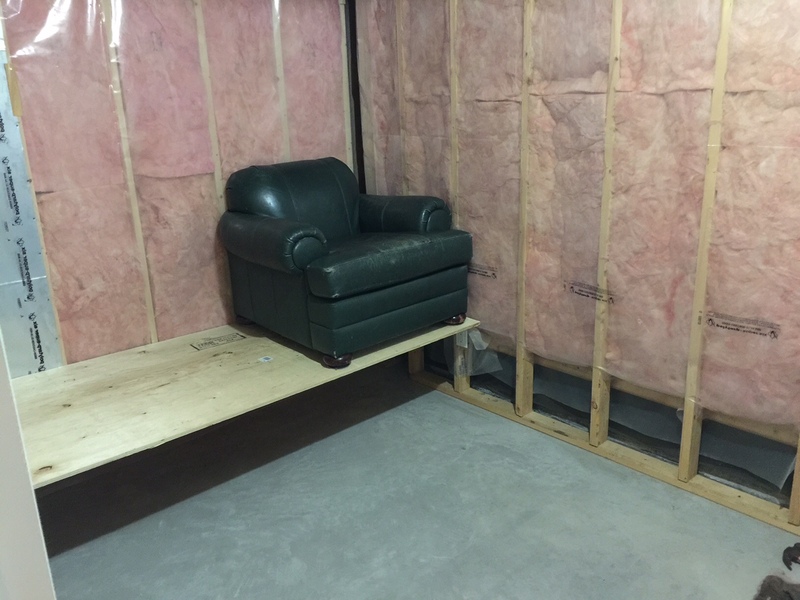 Our loveseat is stored on the top shelf. Our chair came next. So, he built a support for it that looked like two skis, jutting out from the wall. He supported the ‘skis’ using two large pieces of plywood. Our chair suspended 6 feet above the floor. Next, we needed an elegant solution to store two tables. These were exceptionally heavy. After some discussion about technique – lifting with the knees, and using the legs – I declared that we needed to get help from a neighbour. I will spare you further details. Suffice it to say, my husband thought it would be better to involve my stepmother. She is about 5’2″, and as it turns out, very strong. With the three of us lifting, we managed to secure the table to the wall. A heavy table is secured to the wall, protected with a mattress cover. Tonight we will continue to store boxes, and chairs. We are considering suspending our bicycles from the ceiling. 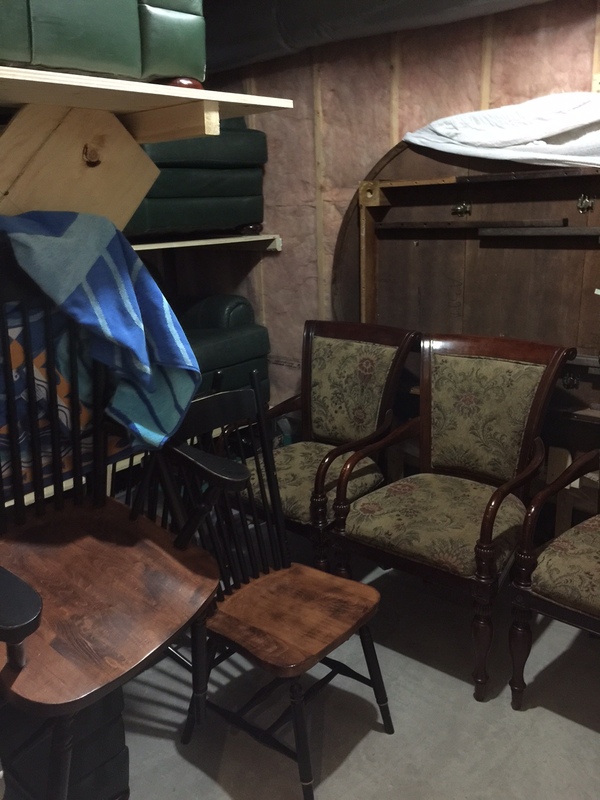 Storage room continues to fill with chairs, and storage bins. My stepmother is staying overnight with us. She helped with our children today, and will be helping us again tomorrow. Today was one of our better days in terms of getting ready for our move. I will be up late tonight, storing boxes.